Sometimes the best way to learn about something is to hold it in your hand. Create a model of a neuron by using clay, playdough, styrofoam, recyclables, food or anything else you can get your hands on. Use pictures from books to give you an idea of where the components of a neuron should go and what shape they should be. Use different colors to indicate different structures. Make a neural circuit with a few of the neurons. Create sensory or motor systems. Eat your model if you made it out of food!! 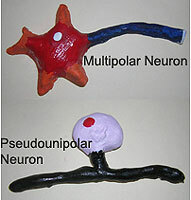 If you would like to use this "build a neuron" as a classroom activity, here is a lesson ready to go. Cook over a low heat, stirring constantly until it thickens. Let it cool a bit and then knead it. Keep in an airtight container so it doesn't dry out. You can also add color to the play dough by adding some poster paint with the liquid instead of food coloring. Try to use as little paint as possible to get the desired color or it will make the play dough sticky. Get out those beads and make a neuron! This neuron with seven dendrites requires 65 beads: 42 beads for the dendrites, 10 beads for the cell body, 12 beads for the axon and 1 bead for the synaptic terminal. String the beads using the pattern in the diagrams below. The string can be yarn, rope, or for the best result use flexible wire. You can also create your own pattern or use a different colored bead for a nucleus in the cell body. Get out those pipe cleaners and make a neuron! This neuron pipe cleaners of 5 different colors: one color each for the dendrites, cell body, axon, myelin sheath and synaptic terminal. Any colors will do. It's a parachute! It's a witch's broom! It's the Eiffel Tower! No, it's a NEURON!!! If you have ever played any "string games," then this neuron model should be easy for you to make. 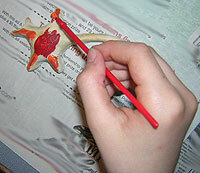 Follow the steps on this page to make a neuron from string. A loop of string or yarn (about 3 ft. in length). This giant model of a neuron illustrates the properties of chemical transmission and the action potential. You must construct the neuron before you use it with a group of people. Cut two to three foot lengths of rope to use as dendrites. Another 10-15 foot piece of rope will be turned into the axon. The cell body and synaptic terminal of the neuron can be plastic containers. Drill holes in the plastic containers for the dendrites and axon. To secure the dendrites and axon in place, tie a knot in the ropes so they will not slip through the holes of the containers. The action potential is modeled with a pool float. Thread the pool float onto the axon before you secure the axon in place. Place small plastic balls or ping-pong balls in the synaptic terminal and your model is ready to go! Get volunteers to hold each of the dendrites. Get one volunteer to hold the cell body and one to hold the synaptic terminal. 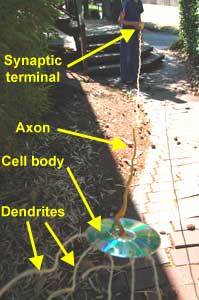 Make sure the person holding the synaptic terminal keeps his or her hands AWAY from the place the axon attaches (more about this later). Get one volunteer who will hold more molecules of neurotransmitter (more plastic balls) near the people who are dendrites. Get one volunteer to hold the action potential. Have the person holding molecules of neurotransmitter TOSS the plastic balls to the people who are dendrites. The "dendrite people" try to catch the plastic balls. This models the release of neurotransmitters and the attachment (binding) of neurotransmitters to receptors on dendrites. When three plastic balls are caught by dendrites, the person holding the action potential can throw/slide the pool float down the axon. This simulates the depolarization of the neuron above its threshold value and the generation of an action potential. 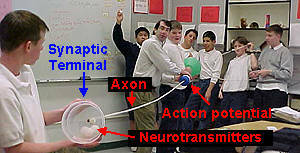 The action potential (pool float) should speed down the axon toward the synaptic terminal where it will slam into the container. This should cause the release of the neurotransmitters (plastic balls) that were being held there. CAUTION: The pool float will travel very fast! Make sure that the person holding the synaptic terminal keeps his or her fingers and hands AWAY from the pool float. Once the action potential starts, it continues without interruption. What can you do with those free CDs you receive in the mail? Make a neuron! Drill several holes in one side of the CD. Tie lengths of wire or string through these holes. These wires or string become the dendrites of your neuron. Attach a long wire or string to the center hole of the CD (or you can drill another hole in the CD for this long wire). 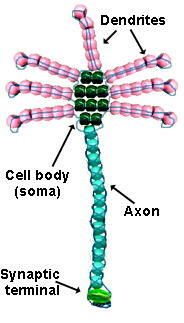 This long wire or string becomes the axon. 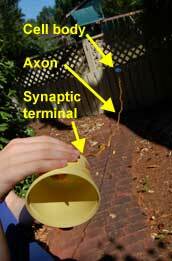 Make a hole in the center of a plastic container and thread the end of the axon through it. The container becomes the synaptic terminal. Cut some pipe cleaners into short pieces. Wrap these short pieces around longer pipe cleaners to make dendrites. Wrap one end of each dendrite around a safety pin. Pin the dendrites to a pink short-sleeved shirt and hat. 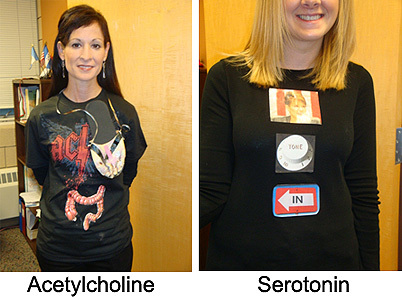 Put on your costume...be a neuron! An edible neuron? Mix one box of Jell-O with water by following the directions on the Jell-O box. After the Jell-O has cooled to a warm temperature, pour it into small plastic bags. Add fruits (canned fruit cocktail works well) and candies to the Jell-O to represent the organelles you would find inside of a neuron. For example, mandarin orange slices could be mitochondria; a cherry half could be the nucleus; red and black string licorice could be microtubules and neurofilaments. The plastic bag can represent the cell membrane. Don't forget ribosomes, the golgi apparatus and endoplasmic reticulum. You should also make a "legend" of your cell so you remember which food represents which organelle. Write your legend on some card stock or index card. After all the "organelles" have been added, tie off the top of the bag with a twist tie and place the "cell" in the refrigerator. When the Jell-O gets firm, take it out, and compare your neuron to other neurons. Then, have a snack...a neuron snack. See cells of the nervous system for more about the organelles found in neurons. Here's the most simple model of a neuron I can think of...and you don't need any supplies. It's your hand! Hold out your arm and spread your fingers. Your hand represents the "cell body" (also called the "soma"); your fingers represent "dendrites" bringing information to the cell body; your arm represents the "axon" taking information away from the cell body. 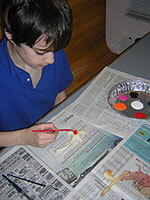 Create a model of the brain by using clay, playdough, styrofoam, recyclables, food, etc. Create a whole brain or use a brain atlas and create cross-sections of the brain at different levels. Use different colors to indicate different structures. Combine all of the ingredients in the ziplock bag and mix thoroughly. It should weigh about 3 lbs. (1.35 kg.) and have the consistency of a real brain. Mix the water, salt, flour and cream of tartar in a large bowl or blender until the lumps disappear. Then mix in the vegetable oil. Put the entire mixture into a sauce pan and "cook" it over low heat until it gets lumpy. Pour the mixture out and let it cool. Then knead and shape it into the form of a brain. Don't forget to add wrinkles (gyri) to your brain. Squirt in red food coloring for blood vessels. 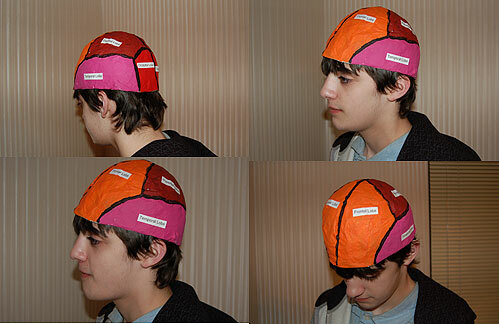 Display your brain on a "Thinking Cap." Thinking Caps are created from papier (or paper) mache. Create the Form: First, create the brain form for the cap. You can create a form from wire (e.g., chicken wire) or a balloon or use a bowl to build your cap around. You could even ball up some newspaper and cover it will masking tape. The form should have the approximate size and shape of your head so you can wear it. Coat the newspaper strips with the paste, and place them on the form. Let each newspaper layer dry before you add a new layer. Add enough layers to give you a strong structure. When the structure is dry, remove the underlying form. You may have to cut the edges of the structure and repair the sides for a good fit on your head. 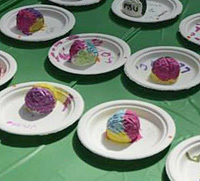 Decorate the Thinking Cap: you can paint the Thinking Cap with the lobes of the brain (see photo) or with the different areas of the cerebral cortex. A Brain Hemisphere Hat you can make from paper. Baked brains and neurons may look and smell tasty, but don't eat them. Mix flour and salt in a large bowl. Add water and mix. The mixture should start to stick together. If the mixture is too crumbly, add a little more water. Spread a little flour on a countertop or cutting board. Work the mixture into a ball and knead it on the countertop or cutting board. 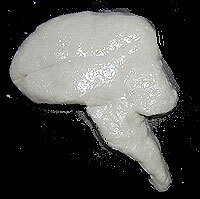 When the mixture can be molded, take pieces and shape them into brains or neurons. Place the finished brains and neurons on an ungreased cookie sheet. Bake in the oven at 350o for 10-15 minutes. The brains and neurons will turn slightly brown, but don't let them burn. Let the brains and neurons cool, then paint them. CAUTION: Be extremely careful using the oven. The cookie sheet and baked items can get VERY hot. Adult supervision is required! Alexandra Colón Rodriguez, a PhD student in Comparative Medicine and the Integrative Biology Program, Environmental and Toxicological Sciences Program at Michigan State University, has created a great hands-on activity learn about the brain. Make brains again and again. 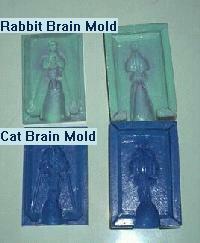 BrainLink has developed cat and rabbit brain molds that you can buy from the Carolina Biological Supply Company (CBS) for $16.95 each (Catalog #MF-95-2849A) . Coat each side of the rubber mold with liquid hand soap. Mix up FAST set dental plaster (also available from CBS) with water to the consistency of toothpaste. Pour the dental plaster into each side of the mold. Sandwich the mold together and wait about 15-20 minutes. Tap the mold a few times to get out all the air bubbles. It can get a bit messy. When the plaster has set and is hard, peel back one side of the mold and remove the brain. You can add food coloring to the plaster while you are mixing the plaster if you want a brain with a bit of color or you can paint the different parts of the brain with different colors. Fast set dental plaster (call a local dental supply company - it is fairly cheap - about $15 for 25 pounds - enough for many brains). Patterson Dental Supply, Inc. also has the plaster (catalog #48512). Their phone number is 1-800-626-5141 or 1-502-459-7444. ...or purchase models that have already been made. Get jello molds in the shape of the brain at Archie McPhee. For about $12 (plus shipping) you get either a gelatin mold of the top half of the brain or a side (lateral) view of the brain. Make brains over and over again. You can also model the meninges (coverings) of the brain by using layers of plastic wrap on top of your jello brain. Make sure everyone gets a taste. Now that's what I call brain food! Add 2.5 cups of boiling water into jello. Stir and dissolve jello. Stir in 1 cup of cold water. Place mold into refrigerator overnight. The human spinal cord is protected by the bony spinal column shown. There are 31 segments of the spinal cord and 33 bones (vertebrae) that surround these segments. There are 7 cervical vertebrae, 12 thoracic, 5 lumbar, 5 sacral and 4 coccygeal vertebrae in the human body. To model these bones, get 33 empty spools of thread (buttons may also work or slices of paper towel holders). Run a string or thread through the middle of one of the spools or buttons. Tie off one end of the string and put the remaining spools or buttons on the string. Each spool (or button) will represent one vertebra. When your model is finished, notice how it can bend. In a real spinal column, the vertebrae are held together by ligaments. Read more about the spinal column. Download or xerox a picture of the brain and color it. 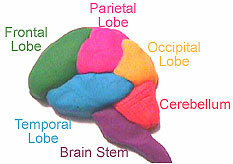 Use different colors to color the different lobes of the brain. Cap Head...No, it's your Brain! A great way to introduce the brain. Get a white swimming cap - you know, the kind that pulls on tight over your head. Draw an outline of the brain on the cap with a black marker. To introduce the brain to your class, wear the cap!! It is a great way to start a discussion. You could also draw the lobes of the brain or different areas of the cerebral cortex on your cap with different color markers. This exercise is to illustrate the complexity of the connections of the brain. Draw 10 dots on one side of a piece of paper and 10 dots on the other side of the paper. Assume these dots represent neurons, and assume that each neuron makes connections with the 10 dots on the other side of the paper. Then connect each dot on one side with the 10 dots on the other side. As you can see from the diagram below, it gets very complicated after a while. I have only connected 4 of the "neurons". Remember that this is quite a simplification. Each neuron (dot) may actually make thousands of connections with other neurons. If you tried this your paper would be really messy!! What better model of the brain than a REAL BRAIN!! Try to get "loaner" brains (human and animal) from your local university (try medical schools, Departments of Biology, Zoology, Psychology). Some animal supply companies also sell brains (see the Resource Page). You may be able to find cow or pig brains at the supermarket or local butcher. Try to get a "Brain Atlas" or look at some pictures of the brains here at Neuroscience for Kids or visit the Mammalian Brain Collection at the University of Wisconsin. This will aid the identification of brain structures. Make sure you wear gloves when handling any specimens. Also be aware that some brains may be perserved with formaldehyde solutions which have an unpleasant odor and also should be handled with care. Identify areas of the brain. Cortex? Cerebellum? Cranial nerves? Compare placement of the cerebellum and spinal cord. Compare size of olfactory bulb. 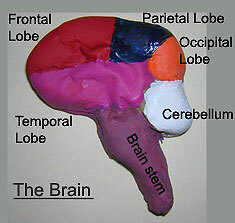 Compare size of cerebral cortex. Try making some sections of the brain. These can be coronal (frontal) sections (across the brain, side to side) to see other brain structures not visible along the midline. Identify and compare what you see. The brain has a tough job. It is works all the time and the eye has to make things difficult. The convex nature of the lens of the eye turns an image upside down on the retina. The brain must make sense of this and turn it "right-side up". To model what a convex lens does to an image, get a magnifying glass. Find a white wall or tape a white piece of paper to a wall that faces a window. Hold the magnifying glass close (3 in; 10 cm) to the white wall or paper. You should see an inverted image of whatever is outside of the window. This is what is projected onto your retina. Read more about the retina. Messages can travel in neurons at speeds up to 268 miles/hr! These signals are transmitted from neuron (nerve cell) to neuron across "synapses." Let's make a chain of neurons...have everyone stand up and form a line. Each person in the line is a neuron. 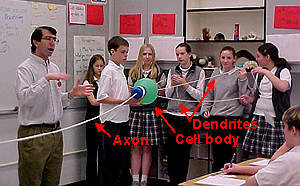 As shown in the figure on the right, your left hand are the dendrites of a neuron; your body is the cell body; your right arm is an axon and your right hand is the synaptic terminal. Your right hand should have a small vial of liquid or some other item, such as a button or pebble, to represent neurotransmitters. Each person should be about arms length away from the next person. When the leader says "GO," have the person at the beginning of the line start the signal transmission by placing his or her "neurotransmitter" into the hand of the adjacent person. Once this message is received, this second neuron places its neurotransmitter into the dendrite of the next neuron. The third neuron then places its neurotransmitter into the dendrites of the next neuron and the "signal" travels to the end of the line. The transmission is complete when the "signal" goes all the way to the end of the line. Remember that each "neuron" will pass its own transmitter to the next neuron in line. Each neuron HAS ITS OWN neurotransmitter. 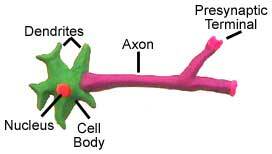 What are the parts of a neuron? The hand that receives the neurotransmitter is the "dendrite." The middle part of your body is the "soma" or "cell body." The arm that passes the neurotransmitter to the next person is the "axon" and the hand that gives the slap is the "synaptic terminal". In between the hands of two people is the "synaptic gap". For more about the parts of a neuron, see cells of the nervous system and the synapse. Saltatory conduction is a way that myelinated axons transmit action potentials. Action potentials jump from node to node. To model this, have everyone stand up and form a straight line. Each person should be at arms length of the next person. Give the last person in line a small object like a ball or an eraser. This time, each person does NOT make up an individual neuron. This time, everyone together is a SINGLE neuron and each person is a "myelinated section" of an axon. The space between each person is a node of Ranvier. To start the axon potential, someone should say "go". The first person will slap the hand of the neighboring person, then that person will slap the hand of the next person etc., etc. Remember, in this model, the line of people is just one neuron. When the action potential gets to the last person holding the object, have this person toss the object into the air. This represents the neurotransmitter (the object) floating out into the synaptic cleft (the air). You can also measure the time it takes the signal to move down the axon using a stopwatch. Measure the approximate distance the signal must travel (the total distance of the all the people). If you then divide the distance by the time, you will get the speed (conduction velocity) of the signal. The conduction velocity of this model neuron will most likely be much slower than in the fastest of real neurons (about 268 miles/hr). Objective: Race to raise the resting potential above threshold to fire an action potential. Background: When neurotransmitters cross a synapse, they can bind with receptors on dendrites. This binding can result in a change in the electrical potential of a neuron. An excitatory postsynaptic potential occurs with the neuron becomes depolarized, raising the electrical potential from its baseline of about -70 mV and bringing it closer to threshold and increasing the chance that an action potential will fire. An inhibitory postsynaptic potential occurs when the electrical potential is lowered, making it less likely an action potential will be generated. If the electrical potential is raised so that it reaches the threshold, an action potential will fire down the axon of a neuron. How to Play: Players should be divided into two teams: the Excitatory Postsynaptic Potential (EPSP) Team and the Inhibitory Postsynaptic Potential (IPSP) Team. The teams will race to see who can get the greatest signal to their team's cell body in 30 seconds. Each team lines up to act like a dendrite. A signal, (a small ball), is passed from person to person much like how an electrical signal travels down a dendrite toward the cell body. Each EPSP team signal successfully transferred to the cell body is worth +5 or +10 mV (millivolts); each IPSP Team signal is worth -5 or -10 mV. The signals are passed down the dendrites until they reach the end and are tossed into the cell body container. Only one signal ball can be passed at a time meaning that a dendrite must drop the ball (signal) into the cell body container before the first person in the dendrite can pass the next ball (signal). To Win: The typical resting potential of a neuron is -70 mV. To cause an action potential the membrane potential must reach -55 mV. Therefore at the end of 30 seconds the signals are summed from the cell body container. The total amount of millivolts is added to -70 mV to see if an action potential is fired. If an action potential is fired the EPSP team wins! If not then the IPSP team wins! About 32 ping pong balls, labeled with black marker -5, +5, -10, +10 (8 of each). Each ball should also be labeled with the team name: EPSP or IPSP. It's a bird, it's a plane....no it's "Nervous System Kid" (also known as "Brain Boy" or "Gyri Girl")! Get a large piece of butcher paper - large enough for a student to lie down on. Have a student lie down on this paper and outline his or her body. Now fill-in and color this outline with parts of the nervous system or use the pictures of the organs supplied below. The brain and spinal cord should be easy. Don't forget the sense organs (eyes, ears, mouth, nose, skin). Follow a diagram of the peripheral nerves to add more features to your drawing. Also, label the structures that are drawn. The cerebrospinal fluid (CSF) has several functions. One of these functions is to protect the brain from sudden impacts. To demonstrate how this works, we need to bring in "Mr. Egghead." Mr. Egghead is a raw egg with drawn-on face. The inside of the egg represents the brain and the egg shell represents the pia mater (the inner most layer of the meninges or coverings of the brain). Put Mr. Egghead in a container (tupperwear works fine) that is a bit larger than the egg. The container represents the skull. Now put a tight top on the container and shake it. You should observe that shaking the "brain" (the egg) in this situation results in "damage" (a broken egg). Now repeat this experiment with a new Mr. Egghead, except this time, fill the container with water. The water represents the cerebrospinal fluid. Note that shaking the container does not cause the "brain damage" as before because the fluid has cushioned the brain from injury. You could make this into a science fair project: test the hypothesis that "The cerebrospinal fluid and skull protect the brain from impact injury." Drop Mr. Egghead from a standard height (or heights) in different conditions: 1) with fluid in the container, 2) without fluid in the container, 3) with different fluids or materials (sand, rocks) or 4) in different shaped containers, etc. Make sure you keep notes to record your observations! One way to learn the planes of sections and anatomical directions is to model the brain with fruit. That's right, fruit....the bigger the better...a melon (honey dew or cantaloupe) works nicely. Make eyes, a nose, ears and a mouth out of cork and stick them on the melon head with toothpicks. Or better yet, get a set of "Mr. Potato Head" body parts and stick them into the melon. The eyes, nose, ear and mouth give a sense of "which way is the front" to the round melon. Now make your sections with a large knife...a coronal (frontal) section first, then a horizontal section, then a sagittal section. See the "slice page" for the correct directions and planes. How many emotions do you have? Happy, sad, mad, surprised? Make an "Emotion Collage" by cutting out magazine pictures of people expressing different emotions. Glue the pictures on a piece of paper or make a poster to show the different emotions. You could make separate papers or posters of different emotions. How is your brain similar to other objects? For example, how is your brain like a bowl of Jell-O? How is it different? Are they both soft? Do they have layers? Can they store information? Do they use electricity? Do they contain chemicals? Give each person a different object. Each person must make a list of similarities and differences between their object and a brain. Suggested objects: Jell-O, tape recorder, balloon, apple, camera, computer, telephone, book, ball. Although it's not too difficult to describe what the brain does, it's not too easy to act it out. Try to describe the functions of the brain and nervous system with this game of "Brain Charades." Mix the papers in a bowl, bag or a hat. A player should pick a paper out of the bowl then act out the function. Everyone else should try to guess what the player is acting out. Actors must remain silent. When someone guesses the action, write the word on the board. Another player should select a new word and act it out. Repeat the game until all of the words have been identified correctly.